Tara Cafiero was born in New York State and received her BFA in printmaking at the San Francisco Art Institute. Currently, she lives in Connecticut with her husband and three children. The couple own and operate a clock manufacturing company called Pink Cloud Gallery. For the past 15 years Tara has been the principal designer for the innovative and colorful clock line, which can be found in stores nationwide or on the web at: www.pinkcloud.com. 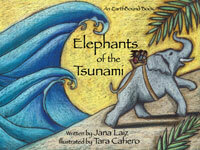 Elephants of the Tsunami is Tara’s first published illustrated book. Her vibrant and radiant style brings this amazing true story to life in a way that is truly unique. The paintings for this book were done using acid-free board and water-based paints, crayons, and pencils.